Just three weeks after he verbally committed to a rematch against top lightweight contender Donald Cerrone, WEC champion Jamie Varner revealed that his doctor would not sign off on his broken right hand and he will have to continue riding the pine. It was expected that the two would tango sometime this fall, however today’s announcement will push that title fight back a few more months. Varner took a controversial split decision over Cerrone at WEC 38 earlier this year. The fight was stopped in the 5thRound due to an unintentional knee to Varner’s head. He was granted the mandatory five-minute recovery period, however complained of dizziness and loss of vision in his right eye forcing doctors to stop the fight. 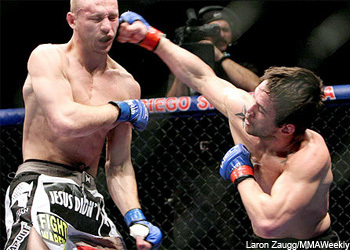 Under the regulations of the California State Athletic Commission, a fight automatically goes to the judges’ score cards when unintentional strikes leave a fighter unable to continue. Although Cerrone’s face was much more battered and bruised, one judge did see the fight going his way as he ended up losing a split decision (49-46, 47-48, 49-46). Following the fight, Varner announced that he had broken his right hand, fractured his foot and suffered a detached retina. With no timetable set for the champ’s return, the WEC is seriously considering manufacturing an interim champion until Varner is able to step into the cage again. Although Scholler said the idea of having an interim lightweight champion was being tossed around the table, it is far from a certainty.